So you managed to get tangled up with some poison ivy, oak or sumac. Don’t panic. Take this bar of soap and scrub. Scrub everywhere. And when you think you have scrubbed everywhere, DO IT AGAIN! This is the best way to stop the spread in it’s tracks. If you are very susceptible to getting a rash from any of the above, put the bar in your backpack when hiking or camping. Maybe keep it in your glove box of your car. The key is to act quickly and wash the affected skin right away. I formulated this bar for maximum results. Everything I put into this natural soap is to stop the spreading of the oils from poison ivy, oak or sumac as well as stopping the inflammation. Jewelweed, pine tar, sea salt, calendula, turmeric, goldenseal, aloe vera. Size: 3" x 2" x 1/2"
Ingredients: Coconut oil, soybean oil, lard, castor oil, jewelweed, pine tar, sea salt, calendula, turmeric, goldenseal, aloe vera. 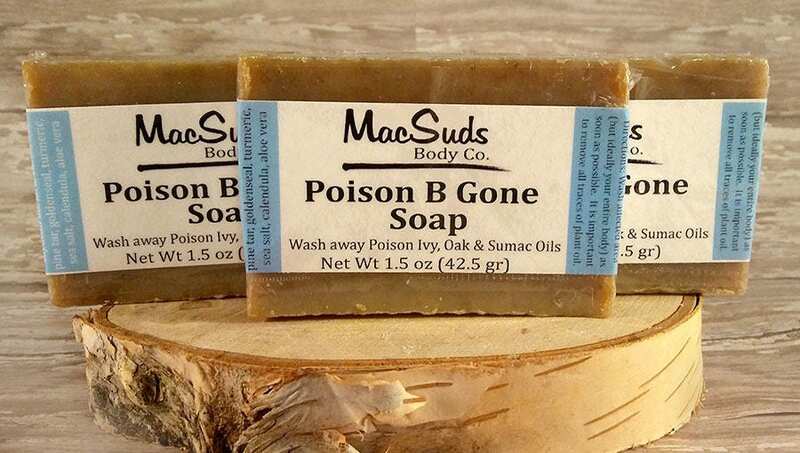 I was happy to find a soap with all the ingredients my research on poison ivy remedies said would aid to healing it. A great price and fast shipping too !